"The moons shine brightly at night. But where the bright pale light shines, the darkness is that much deeper. As the people, as the Khajiit live in the light, so things live in the dark. These are the Dro-m'Athra." The term Dro-m'Athra has numerous translations or meanings from Ta'agra, including Dark Spirits, Ghost Cats, Lost Cats, Children of the Dark Moon, Children of Lorkhaj, Children of Namiira, Namiira's Dark Litter, Bent spirits, and Moon-haters. The short form of this name is 'mathra. The Dro-m'Athra just appear outside the Tamrielic pantheon; in the culture of the Khajiit alone. They can be considered Daedra, insofar as the term means 'not-Aedra'. The role of Namiira and Lorkhan in relation to the Dro-m'Athra can be each swapped in some occasions. The exact origin of the Dro-m'Athra is unknown. Legends speak of warriors that went to war with the stars, but how this turned them into Dro-m'Athra remains unknown. In general their existence is explained with the duality of light and darkness. Just as the Khajiit are children of Jone and Jode, the Dro-m'Athra are children of the Dark Moon. The Khajiit just rarely talk about Dro-m'Athra, but when they do its only under the light of the moons. 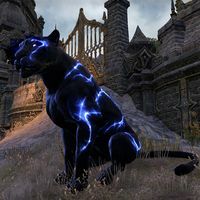 Khajiit who have been educated by a Clanmother or read children's stories should know about the existence of the Dro-m'Athra. This knowledge however is often just seen as fiction and stories to scare children. In Temples of Two-Moons Dance and monasteries the true knowledge about the Dro-m'Athra and how to fight them is preserved and spread. The fur of Dro-m'Athra is completely black. It is crossed by lines of blue, glowing lightning. Their eyes glow completely white and in darkness. The equipment of Dro-m'Athra follows a similar pattern. Their weapons and armor show repeating lines of blue lightning and the symbol of a waning moon, as this is the time they grow stronger until they reach the height of their power at new moons. Mostly this is expressed by two waning moons—one for Jone and one for Jode. On Dro-m'Athra staves, the Third Moon is also symbolized. The armor, especially the shoulder pieces, appear with many spikes. 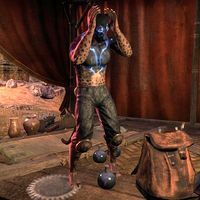 Atypical for Khajiit, their boots and gloves do not have open fingers or toes for their claws. Reaper's March is dotted with numerous old and forgotten subterranean temples where Dro-m'Athra are imprisoned. Such places can be felt vaguely by mages, as Greenshapers. Dro-m'Athra can, alternatively, be summoned by rituals at any place on Tamriel. These summonings use either totems or crystals. Corrupted shrines to the moons also allow Dro-m'Athra to boil up from the earth. Besides the Dro-m'Athra, there are also Dar-m'Athra, though no differences between the two are known. Sa-m'Athra and Sar-m'Athra is the name of Dro-m'Athra senche. Whether they are animal Senche or Khajiit Senche is unknown. The power of the Dro-m'Athra is strongest on new moons. Their influence spreads at a location faster, the more victims they found at it, or if supported by rituals or objects. If a Dro-m'Athra is in possession of a living body, as happened with Akkhuz-ri and the Dark Mane, it can increase its power. By using this power, a Dro-m'Athra can free other dark spirits from their prisons beneath the earth. They also can kill the body they posses and create a copy of it, but cannot mimic their speech. A killed, formerly possessed, body can be identified by open wounds that make it appear as if something tore its way out of it. Dro-m'Athra can also posses non-khajiit. The way a Khajiit becomes a Dro-m'Athra can be roughly separated into multiple stages. Normal Khajiit dance to the moonlight at any time and follow Riddle'Thar by this. These Khajiit are called True Cats. When True Cats see a Dro-m'Athra dancing their Bent Dance (Zha'ja Lorkhaj), only willpower can prevent a True Cat to give in to the Bent Dance. It is a dance without music, only following the rhythms of the beating Heart of Lorkhan. 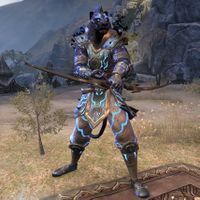 Khajiit that are already accessible to corruption by flaws of personality could hear Namiira whispering secrets to them, or the beating of the Heart of Lorkhan itself. The usage of Skooma could also increase the influence of the darkness on them. Even talking about Dro-m'Athra in moonless nights could allow influence on True Cats. The singing of songs near Dro-m'Athra likewise can give them the chance to influence others. As soon as a Khajiit falls to one of these forms of corruption, its shadows grow longer. As soon as the darkness outweighs the light of the moons and the Khajiit's tail "gets straight", the True Cat is lost. Such a Khajiit is then called a Bent Cat. Their soul can then be stolen by a Dro-m'Athra and sent to the Dark Behind the World, to Namiira. The starting corruption by Dro-m'Athra can express itself by strong pain and voices in the head. It is not limited to Khajiit alone. As soon as the soul of a Bent Cat hears the beating of the Heart of Lorkhan and gives in to it, the Khajiit is lost. The soul now serves the will of Namiira and Lorkhan. There is no rescue once this point is reached. A Lost Cat is a complete Dro-m'Athra in the moment they die. A Khajiit can be rescued, depending on how strong the corruption is. One possibility is the Chase Away Song (S'virash Sahaala). But if the corruption grows too strong, the song does not work anymore. However, it can still be used to cast the Dro-m'Athra back. To destroy a Dro-m'Athra completely, one would have to fight one at their home in the darkness between the stars. The Dro-m'Athra can be fought and sent back to the darkness by violence alone. But this does not banish them permanently. By using rituals to bathe the Dro-m'Athra in moonlight, they can be fought and banished permanently. This way however is only known to those of knowledge, usually moon-priests. Such rituals can include prayers to the moons or the Chase Away Song by e.g. the Twilight Cantors. Another possibility to fight Dro-m'Athra can be ritual objects. They repel them, as soon as they come too close to the object. If such a object is charged with the essence of Dro-m'Athra and strengthened by a prayer to the moons, it can send the Dro-m'Athra away if it tries to take control over the wearer's body. Sigils in temples can also keep Dro-m'Athra away. For game-specific information see the ESO article. This page was last modified on 25 February 2019, at 23:00.